The Tip of the Nose is part of the Arabian megaconstellation of the Lion (al-asad). The related verb nathara means “to scatter” or “to disperse,” so the noun an-nathra in its basic sense indicates “a scattering.” For obvious reasons, this word also came to indicate a sneeze, and by extension the tip of the nose, the place from which the sneeze originates. This is precisely what the Arabs saw in the Tip of the Nose, a pair of dim stars that appear to have sneezed out the star cluster, which on account of its dimness appears as a fuzzy blotch in the sky. 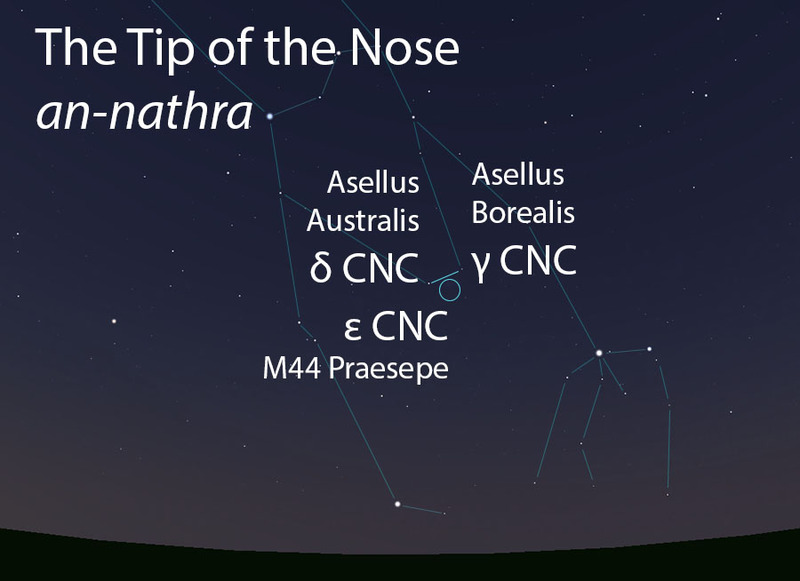 More explicitly, some Arabs saw the two stars of the Tip of the Nose as the Two Nostrils (al-mankhiran) and the star cluster alone as the Sneeze (an-nathra). 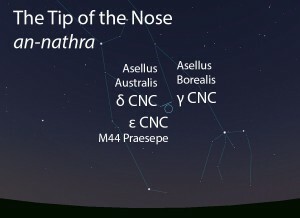 The Tip of the Nose (an-nathra) as it appears in the west about 45 minutes before sunrise in early January. Sky simulations made with Stellarium. A pair of unremarkable stars with a nearby faint star cluster that appears as a patch of cloud in the night sky. In the calendars of Qushayr and Qays, the morning setting of the Tip of the Nose occurs during the cold winter season called ash-shita’. In early listings of the lunar stations, the Tip of the Nose is the tenth station of the year. This was later changed to the eighth lunar station after the stations were adjusted to begin with the vernal equinox. The stars of the Tip of the Nose roughly match the Hindu nakshatra called Pushya. The Tip of the Nose is part of the Lion (al-asad, الأسد) folkloric celestial complex, which extends from the Two Forearms (adh-dhira’an, الذراعان) to the Two Shanks (as-saqan, الساقان).